I fly JetBlue a lot. According to Openflights.org, I’m at 34 segments and 48,497 miles so far this year. From 2010 through 2014, I’ve averaged a bit over 86,000 miles a year on the carrier. For the second year in a row, I qualified for JetBlue’s frequent flyer program, Mosaic, by June. With the exception of the odd international trip here and there, the majority of my air travel is domestic which is how I’m able to standardize on JetBlue. As to why I’ve standardized on JetBlue, that question is just as easy to answer: legroom. 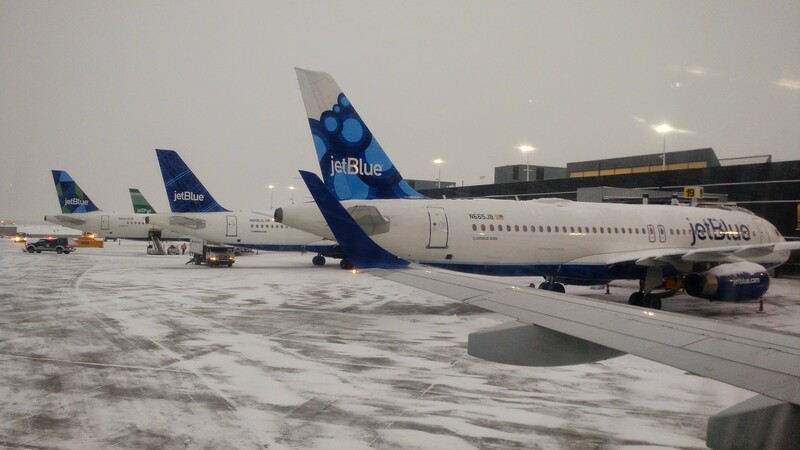 There are a lot of reasons to like JetBlue: the planes are in reasonable shape, the staff is friendly and helpful, and they are typically cost competitive. But for me, it’s always been about the legroom. Of all of the major domestic carriers, JetBlue is the only one with regular economy seats that don’t require me to be shorter. My knees will brush the front of the seat in front of me, but I have just enough room that flying coach is not the excruciating experience that it is on, say, United. It’s possible, however, that 2015 could be my last year as a JetBlue regular – my earned 2016 Mosaic status notwithstanding. The carrier has two problems. First, they’re taking away some of the core features that made flying JetBlue a different, more pleasant experience. Second, their rewards program for those of us who fly a lot isn’t particularly competitive. In the airline’s defense, it’s not their fault they’re about to get worse – it’s Wall Street’s. Equity analysts covering the carrier got tired of Chief Executive Dave Barger being “overly concerned” with minutiae like passenger comfort and eschewing the nickel-and-diming approach of its competitors. Which is presumably part of the reason why he got to add “Former” to his job title. Under the leadership of Barger’s replacement, former British Airways executive Robin Hayes, JetBlue customers can now look forward to additional baggage fees and 15 additional seats per plane – which is another way of saying less legroom. This might be acceptable if JetBlue took care of those who flew the airline the most, but its Mosaic program is relatively benefit free. It eliminates change fees, which does save me a few hundred dollars a year when schedules change. Mosaic also allows me to board first, but the extra fee Even More Legroom seats I typically purchase for longer flights board early as well. The program waives checked baggage fees, but if you fly enough to qualify for Mosaic you should know better than to check bags. I certainly don’t. Nowhere in there, noticeably, is any mention of upgrades. Most frequent flyer programs include the ability to earn upgrades to first class, or the ability to purchase them at a discount. Virgin America, for example, lets its Gold and Silver flyers upgrade to the equivalent of Economy Plus for free, and purchase unsold first class inventory at a fraction of the retail cost. One friend tells me he regularly upgrades to first class on flights in and out of Boston for $200 or less. JetBlue, by contrast, offered six complimentary upgrades to Even More Legroom seats for Mosaic members the first year of the program (which you could not redeem online or at the airport), then quietly eliminated that offering. And there is no formal upgrade path whatsoever – free or paid – to their new first class Mint seats. Which leaves us with an airline that by all accounts is poised to substantially downgrade its customer experience, removing much of its competitive differentiation in the process. Worse, the carrier is without a competitive loyalty program for frequent flyers to compensate for the reductions in service. I really have enjoyed flying JetBlue over the years, but it’s about to get harder to find reasons to not give my business to alternatives like Virgin. I’ll be watching how the company behaves through the end of the year, but for the first time in years I’m evaluating my options for standard carriers in 2016 (non-United suggestions welcome). If I’m going to have to shoehorn myself into a seat regardless of where I fly, I might as well pick an airline that will at least give me a shot at the sweet, sweet legroom of first class. Still, my first choice would be to keep flying JetBlue, provided they can get their act together. You guys listening?